Have you accidentally associated your Google Voice number with incorrect Google account? This may happen, as many users tend to use multiple Google accounts for different professional and personal reasons. You can easily transfer your Google Voice number from one Google account to a different Google account. However, for making this migration you need to contact Google for the transfer. Once you provide information regarding your Google Voice number and involved Google account(s) – Google will start transfer procedure for you. 1. Make sure you know the correct voicemail pin number (it is a 4 digit number and it is not your Google account password). If you do not know voicemail pin for your Google Voice account, you can reset it from Settings > Voicemail & SMS. 2. If Google account where you want to transfer the Google Voice number already has associated Google Voice number – you should be prepared to delete existing Google Voice account. Everything related to Google Voice number for Google account where you want to transfer the other Google Voice account will be removed including: numbers, credit balance, call history. 3. Whole transfer process may take upto 2 weeks to complete and it is solely at discretion of Google for transferring your Google Voice number to different Google account. 1. Open request webpage [Not available now, spreadsheets.google.com/a/google.com/viewform?formkey=cjlWRDFTWERkZEIxUzVjSmNsN0ExU1E6MA&amp;ndplr=1] for Google Voice account transfer. Read the instructions carefully and confirm conditions to qualify for the transfer process. 2. Then enter your Google Voice number. Also, enter Google account you accidentally signed up for Google Voice account and also the Google account where you want to transfer the Google Voice account. 3. Enter your valid email address for follow up contact on transfer progress. Also describe on reasons for requesting such transfer. 4. Enter correct 4 digit Google Voice pin number. Check conditions for agreement and permission for the transfer process to begin. 5. 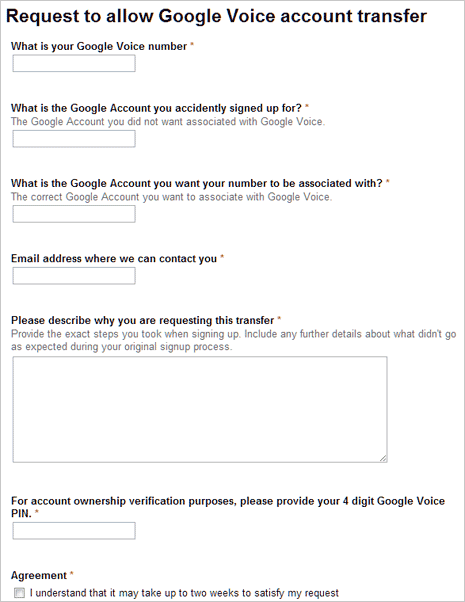 Click Submit for submission of transfer request of Google Voice account to another Google account. Whole transfer routine may take 2 weeks or more to complete. You should get transfer notification on provided email address.